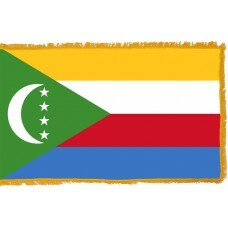 The Comoros Flag consists of four horizontal bands that are yellow, white, red, and blue. On the left side of the flag is a green triangle that has a crescent and four, 5-pointed stars next to it in the center. The four bands of the flag are symbolic to the four islands. The yellow band represents Moheli, the white band represents Mayotte, the red band represents Anjouan, and the blue band represents Grand Comore. The stars and crescent in the center of the flag are symbolic of Islam. 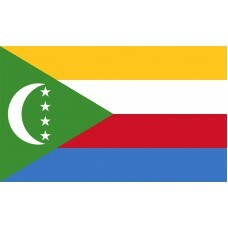 The crescent and stars used on the Comoros Flag are a design that has been used on the country's flag since 1975, during the independence movement. 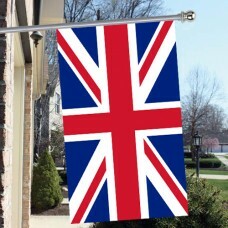 Since 1975, the flag has been changed many times. The first Comoros Flag was adopted in 1963, before the country gained independence. It was then changed in 1975, when they gained independence and were ruled by Ali Soilih. In 1978, Ahmed Abdallah became President and the flag, once again, was changed. 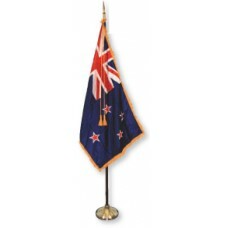 The current flag that is used today, was designed in 2001 and adopted on January 7th, 2002. Comoros is an island country in East Africa, in the Indian Ocean between Mozambique and Madagascar, with other neighboring countries that include, Tanzania and the Seychelles. Its largest city and the capital city is called Moroni. Moroni is also referred to as "in the heart of the fire" due to the fact that the city is located at the bottom of "Mount Karthala" which is an active volcano, that has erupted over 20 times since the 19th century. Comoros is referred to as "Perfume Islands" as many flowers and spices are grown here that are used to make perfume. In 1841, the French established a colony in Mayotte following a treaty that the King signed, giving Comoros to the French authorities. In 1961, the islands gained political independence and during a treaty in 1973, it was agreed that the islands could have full independence in 1978. On July 6th, 1975, three of the islands finally managed to gain independence but the island of Mayotte voted against it and chose to remain under the French authority meaning that the Comoros government only had control over Anjouan, Grand Comore and Moheli. Since gaining independence, there have been many attempted invasions to the country. Comoros is considered to be one of the poorest countries in the world. The economy is mainly supported by fishing, farming, and hunting with unemployment being very high, yet it is a very beautiful country and home to some stunning, old and historic landscapes. In the capital city, Moroni, some famous attractions include The Historic Medina and the Badjanani Mosque, which dates back to 1427. Another main attraction is "Mount Karthala" which is the tallest mountain in the country.